Syed Muhammad Naquib al-Attas is an internationally renowned Muslim thinker, philosopher and educationist from Malaysia. He is thoroughly rooted in the traditional Islamic sciences in a manner that allows him to competently bring that tradition to bear incisively and constructively on modernity. One major positive result of his close enagagement with the secularizing spirit of modernity is his original idea of ‘Islamization of Knowledge’ imbuing his philosophy and practice of education which leads first to the Dewesternization and then Islamization of the mind, body and soul and its salvific effects on the personal and collective life of Muslims as well as on others, including the natural environment. According to Professor al-Attas, the process of Islamization is the revivification of the Worldview of Islam within the hearts and intellects of Muslims in the context of close, constructive engagement with the West, and the corresponding cognitive and practical ordering of their physical and spiritual experience of existence in accordance with it. Professor Al-Attas’s conception of Islamization and his exposition of the Worldview of Islam, as explicated in his many important works, are universally recognised to be most articulate, authentic, coherent and comprehensive. Clearly, Islamization is fundamentally an educational and intellectual program of the most profound order, requiring the long- term combined efforts of authoritative, farsighted and committed scholars, intellectuals, ‘ulama’, researchers, teachers and students, including policy makers, who share a common vision of its goals and methods. The mission of Islamization obviously has its social, cultural, intellectual, economic, political and legal implications, but these are to be realized over the long term by many conscientious individuals thoroughly imbued with adab in their thinking and acting, and in their private and public conduct. For the crisis of Muslims today is basically the intellectual and spiritual crisis of identity due to their loss of true knowledge (‘ilm) and of right action (adab). Therefore the way forward out of the crisis for Muslims is self-knowledge, self-understanding, self-definition and self-reformation, spiritually, intellectually and socially, both at the level of the individual and at the level of the communal. 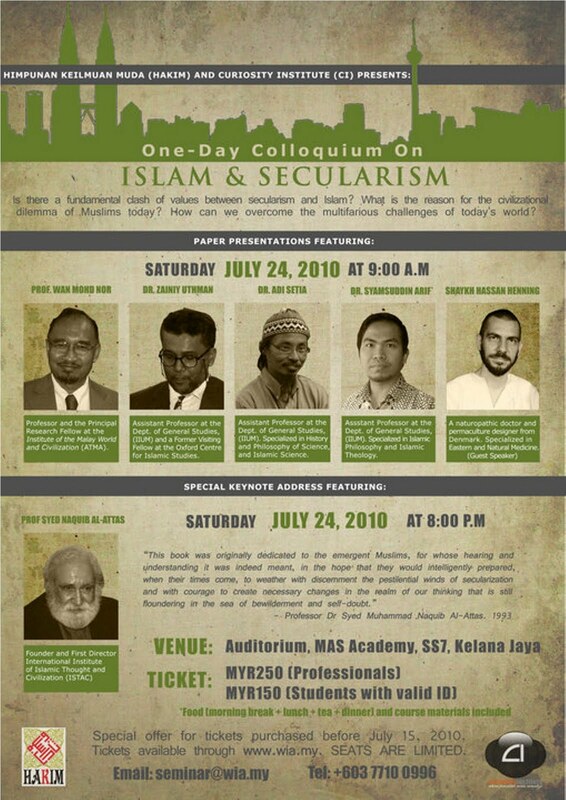 In this regard, HAKIM is most honored and happy to organize this one day colloquium on Islam & Secularism, the influential book in which al-Attas systemically synthesized his ideas on Dewesternization, Islamization, Education in the context of close engagement with the hegemonic, secularizing tendencies of modern, Western thought. The colloquium will discuss four main themes of that book through presentations by four of Professor al-Attas’s foremost students, and will culminate in a keynote address on the “Dewesternization of Knowledge” by Professor al-Attas himself. In conjunction with the colloquium, HAKIM is also officially announcing and launching its structured educational program for the general public called “Readings in the WoRldvieW of islam pRogRam” (RWip). RWIP consists of a series of certificate courses on various salient aspects of the Worldview of Islam as expounded in Professor Syed Muhammad Naquib al-Attas’s many important works. These courses are intended for people who have been exposed to Professor al-Attas’s teachings through various talks, seminars and workshops, but who would now want to acquire a deeper, transformative understanding by enrolling in a series of formal educational courses which allow for closer intellectual interaction between teachers and students. The teachers selected to conduct the courses in the RWIP are from among the pioneering graduates of The International Institute of Islamic Thought & Civilization (ISTAC) who have themselves devoted many years of their life to the intellectual and moral guidance of Professor al-Attas himself, ISTAC’s Founder and first Director. Each certificate course is based on a work by Professor al-Attas, such as Islam and Secularism or The Concept of Education in Islam, with the pedagogic approach centered on reading, discussing and understanding the text with a view toward working out in thought and in act its transformative, operational implications. Sangat betul bahwa islam sculerisme dan liberalisme skarang sangat menyusahkan yg laen.